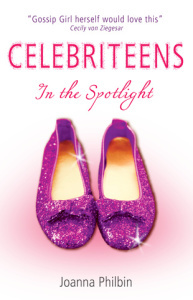 In America, the Celebriteens books are published under the series name The Daughters – alluding to the fact that although its teenage lead characters aren’t famous in their own right, they’re growing up in the shadow of parents who are. The author herself is the daughter of US talk show host Regis Philbin, and while this is definitely no autobiography I suspect it may well be personal experience and observation which lend the first instalment in the series its genuine, heartfelt quality. The series has been rebranded for the UK as Celebriteens, and it lives up to its glamorous new name one hundred percent. Book one sees unconventional-looking Lizzie Summers dealing with a fairy common teenage problem – she doesn’t measure up to those perfect-looking models in the magazines – but with the uncommon added pressure of daily life with a mother who actually is one of those models. Lizzie’s self-confidence takes a bashing every time she’s forced to accompany her mum to another A-list party, and her supermodel mother doesn’t seem to have any idea what it’s like for her. Add in some trouble with schoolwork and a crush on the cutest boy in school, and along with her best friends Hudson and Carina, Lizzie’s just a regular teenage girl… but when she messes up, the whole world knows about it. A cover quote from Cecily von Ziegesar states that Gossip Girl herself would love this book, and while there are some major similarities between the two series – the New York setting, the red carpet events, the super rich lead characters – there are some major differences too. Lizzie, Carina and Hudson are a couple of years younger than Blair and Serena, and the story reflects that. This is a book about the importance of friendship, staying true to yourself and the bittersweetness of first love. Despite the glitz and glamour of Lizzie’s lifestyle, tween readers will relate to her because underneath it all, her problems are universal. I’d recommend this one to readers in the eleven to fourteen age group who would like the inside scoop on what it’s really like to be the daughter of a rich and famous parent.